bbc.comAnother Premiership season, another title for Saracens. Or so the predictions go.Three months after winning their third final in four years, Sarries commence their latest quest for domestic glory with a trip to Newcastle Falcons on Sunday.Before that, the season gets under way with a West Country derby as rebranded Bristol Bears host Bath at Ashton Gate on Friday. Former British and Irish Lions trio Jeremy Guscott, Matt Dawson and Ugo Monye, who each enjoyed Premiership title glory as players, preview the new season alongside BBC Sport's rugby union reporter Chris Jones.The quartet share their title and relegation predictions and give an insight into who could shine and who could flop.And you can have your say, too, by voting at the bottom of this page. Voting will close at 19:00 BST. Ugo Monye: "Saracens are my pick. They're the defending champions and to win it last season they had to grow and learn how to get out of trouble. Going into a World Cup year you would expect all of their England internationals to peak and play their best rugby, so that makes them even more dangerous." Matt Dawson: "With young senior players such as Owen Farrell, Alex Lozowski, Maro Itoje and Jamie George there's no reason to suggest that there will be a let up domestically by Saracens. Not only do they have star names, they have got a deep squad too. "Jeremy Guscott: "It's hard to look past Saracens, the way they finished after an indifferent spell in the middle of last season was nothing short of brilliant. Along with Sarries, Exeter are now an established force and have moved away from the other 10 teams in terms of quality and consistency of performance. The way Joe Simmonds, their rookie fly-half, came in and didn't miss a beat is a sign of how well integrated all players are at the Chiefs and what a great job Rob Baxter and his coaches do." 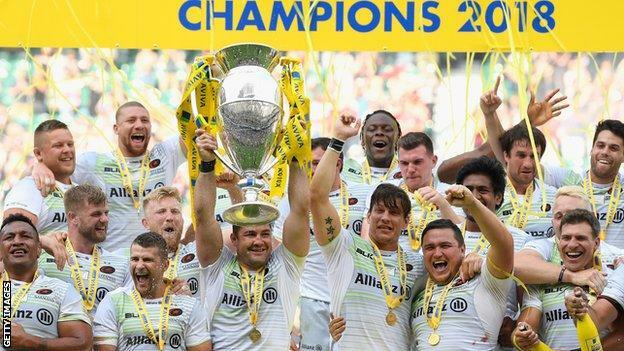 Just as the experts unanimously agree that Saracens are hot tips for the title, they also predict a season of woe for Worcester - a club that has been up for sale since early last season.Historically, the side promoted to the Premiership tend to plunge straight back into Championship - as Bristol and London Irish have in the past two seasons - but the manner in which Pat Lam's Bears have returned to the top flight and recruited has impressed those in the know.JG: "Worcester, with all their off-field uncertainty, look very vulnerable. They have recruited largely from outside the Premiership and not a lot of current internationals. While this looks like a ploy to keep selections consistent by not losing the international talent already at Sixways, I feel they will still struggle. Any team that doesn't have an established and interchangeable front five and consistent number one picks at nine and 10 will struggle. "UM: "Worcester will struggle. They haven't thrived in the Premiership for the past few seasons and competition this year is going to be stiffer than ever. Bristol have invested big, they've got a proper coach in Pat Lam and there's a belief within the community they will stay up." CJ: "The obvious answer to the relegation question is Worcester, who have perennially been at the bottom end of the table in recent seasons. With Pat Lam at the helm and a star-studded squad, which has had a year to build in the Championship, I do think Bristol will have enough to stay up. Harlequins may also find themselves at the wrong end of the table. "MD: "It's between Bristol and Worcester. Bristol's star recruitment may just edge it but they need to gel quickly before the tougher winter months mentally test the imports. Worcester have a fabulous set up but I'm not sure Alan Solomons is the forward-thinking coach they need to drive a long-term success." Which new arrivals should we look out for? A former Wallaby captain, a troubled England wizard and a former All Black capable of giving Wasps renewed sting are among the ones to watch this season.MD: "Bristol have broken the bank with former Australia captain George Smith, the Piutau brothers (Charles and Siale), Steven Luatua, Nic Stirzaker and Luke Morahan. There are no excuses, they have to stay up. If they click and steer clear of injuries, Ashton Gate could be rocking. "JG: "Lima Sopoaga looks to be an amazing signing - his ability in attack is special and his ability to step off both feet brilliantly will hold defences rooted to the ground and create space for his mates outside. I feel he will have the same effect Kurtley Beale had when he played at Wasps. The prospect of Sopoaga linking up with the likes of Willie le Roux, Elliot Daly and Christian Wade is mouthwatering." CJ: "Whether you feel Cipriani should be England's number 10 or not, there is no doubting his ability to conduct a Premiership backline. He will demand the highest standards of his team-mates on the field and could be the man to fire Gloucester from mid-table mediocrity to play-off contenders. I'm also keen to see if the new Northampton backs coach Sam Vesty can bring some much-needed spark and cohesion to Saints." Which young guns are set to break through? With England finishing runners-up at the World Rugby Under-20 Championship earlier this year, the nation's sixth successive final appearance, emerging talent is queuing up across the Premiership.From the fringes of Eddie Jones' England squad to the understudies at club level, the rule is run over the next generation and those poised to make the next stride in their careers.UM: "There are a few who could shine but I think we will see a big year from Joe Simmonds at Exeter. He broke through at the end of last season but he's now been given the reigns at fly-half and will be starting this year - it could be huge for him. "CJ: "Worcester's 18-year-old centre Ollie Lawrence is one to watch. He is on Eddie Jones' radar already after being called into an England training camp in May and has been getting plenty of game time for the Warriors in pre-season. That could prove handy experience as Ben Te'o is likely to be unavailable for large chunks of the season. Fly-half James Grayson, as Dan Biggar's understudy at Northampton, will also get plenty of senior minutes this season. "special guide.MD: "There are plenty of junior internationals knocking on the door - my godson James Grayson for one. But I want to find where the next generation of scrum-halves are. Behind Ben Youngs and Danny Care we've yet to see a real challenge, so will this be the year? There's Harry Randall at Bristol, Max Green at Bath, Jack Maunder for Exeter and Saints man Alex Mitchell, as well as Saracens' Ben Spencer and Wasps' Dan Robson. Eddie Jones will give opportunities in training, but if there's an injury to Danny or Ben who grabs the number nine jersey? "JG: "Elliot Daly is far from a breakthrough player, but I would love to see him go injury free and step up further. In my eyes, he is the most gifted English player in the Premiership - his skillset is world class. For him to now show more, he simply needs to see more of the ball and playing on the wing doesn't always allow that to happen, so I would move him to centre for England." What will be this season's biggest surprise? Will Danny Cipriani have Kingsholm rocking like it was 1999 and are Sale already counting the costs of early season absentees?We have nine months' worth of Premiership hits, highs and history to unfold ahead of us - and here are some of the storylines that just may end up surprising us.CJ: "Free from the challenges of the Champions Cup, I think Sale will make the top six. If Chris Ashton (suspension) and Faf de Klerk (international duty) had been available for the start of the season, I think they could have even been outsiders for the top four. "UM: "The league is so tight this year I don't think we will get any surprises. Although, this time last year no-one predicted Newcastle would be in the top four at the end. I think the teams which were mediocre last season will get better and the points tally needed to stay up will be broken this season. Everyone on paper has a very competitive squad. "MD: "Could this be Gloucester's season? It would definitely be a surprise as year after year they've flattered to deceive. If Danny Cipriani pulls the strings we may find ourselves reliving the days of the '90s and a formidable Cherry and White set-up. "JG: "Any team breaking the stranglehold Sarries and Chiefs have on winning the Premiership final would be a surprise packet because these two sides have monopolised the trophy for the past four seasons. It's hard to see a team that has a powerful enough front five that is consistently intense and interchangeable to compete against them." If you are viewing this page on the BBC News app please click here to vote[/i].